The Morcom Rose Garden is a rare 7+ acre green oasis located on Jean Street, one block off Grand Avenue in Oakland, CA. This public garden jewel is a 30’s era formal rose garden surrounded by winding paths, graceful stairways, dramatic water features and enough natural habitat to attract and provide a sanctuary for a variety of birds, including hawks, as well as the neighbors who walk through it regularly. Recently accredited by the American Rose Society, the Morcom Rose Garden is an asset for all of Oakland. Please enjoy our ever-growing slideshow of photos. Or join us and add your own over in the Friends of Morcom Flickr Group. 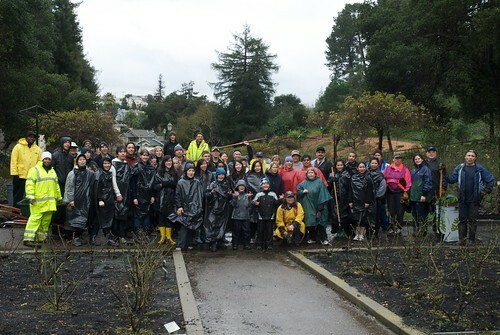 Since we are part of the Friends of Oakland Parks and Rec organization, you can donate indirectly to the Rose Garden through their site. Click here to find out more. To ensure your donation is earmarked for the Friends of Morcom, you may write a check, and note us in the "Memo" section. Alternatively, drop off your donations with Tora during any of our work days at the garden.